Carib Indians aggressively prevented European settlement on St. Vincent until the 18th century. Enslaved Africans, whether shipwrecked or escaped from Barbados, St. Lucia and Grenada, intermarried with the Caribs and became known as Garifuna or Black Caribs. St. Vincent & the Grenadines is a nation of 32 islands located in the Lesser Antilles area of the eastern Caribbean Sea between St. Lucia (24 miles to the north) and Grenada (75 miles to the south). The largest and northernmost island is St. Vincent (about 133 square miles) which has a forest-covered mountainous interior that is dominated by La Soufriere, a 4,000ft tall active volcano. On the south west coast is Kingstown, the nation's capital. St. Vincent and the Grenadines enjoy a tropical climate with the hottest and most humid months being June through September when temperatures reach an average high of 86°F. The most popular months for tourism are December through May when the climate is more moderate (although trade winds provide a welcome breeze all year round). The driest months are January through May and the wettest month is July. There is a theoretical risk of hurricanes between July and November though they usually pass to the north of the islands. The small private islands of Palm Island and Petit St. Vincent have 110V 60Hz electricity supplies and use a US style 2 pin system. All other islands have 220/240V 50Hz supplies and use a UK style 3 pin system. There is extensive mobile telephone service found throughout the islands. St.Vincent and the Grenadines is 4 hours behind Greenwich Mean Time (GMT-4) and daylight savings time is not practiced. It is illegal to wear camouflage clothing in St.Vincent and the Grenadines. Driving in St. Vincent & the Grenadines is on the left according to British tradition. Visitors are required to purchase a temporary license for EC$65 and must be able to produce a domestic driving license. The official language is English and an English-based Vincentian dialect is widely spoken. Visitors to St.Vincent and the Grenadines must be in possession of a valid passport and a return or onward ticket. Visas are required from nationals of The Dominican Republic, Jordan, Syria, Lebanon, The People's Republic of China, Iraq, Iran and Nigeria. A Departure Tax of EC$40 per person must be paid by all visitors who have been in the country for 24 hours or more. 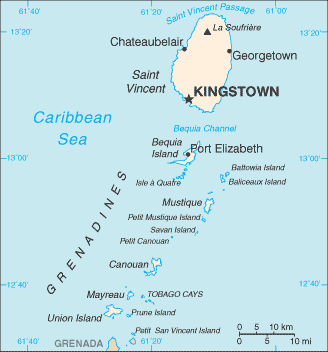 St. Vincent and the Grenadines is an independent parliamentary democracy and member of the Commonwealth of Nations. Their parliamentary and legislative systems are derived from the British model with 15 elected representatives, 4 senators and a prime minister serving a maximum 5-year term of office. Queen Elizabeth II is represented by a Governor General. The Government's website is found at www.gov.vc. Formerly comprising a strong agricultural base with bananas serving as the chief export crop, the economy of St.Vincent and the Grenadines is increasingly dependent on tourism which is now the nation's primary source of overseas exchange. The culture of the islands is dominated by the traditions of the African people that form the vast majority of the citizenry. Many traditional dance, artistic, craft, musical, and style of dress examples can be seen throughout the islands. Modern music, art, dress, and entertainment is also common. Many festivals take place throughout the year on the islands. Many activities geared toward tourism are available. Like any nation, St. Vincent and the Grenadines need clear, accurate, and consistent presentation of the Bible for evangelism and instruction. 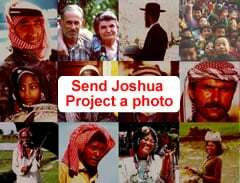 Patient evangelism, instruction, and discipleship equipping the local people for outreach to their friends and neighbors will benefit the islands the same as it will anywhere else in the world. * Pray that the established religions in the islands are Biblical and dedicated to living the word of God before this somewhat isolated population. * Pray that these islands will become a central location of evangelism and discipleship for the Caribbean island region. http://www.everyculture.com/No-Sa/Saint-Vincent-and-the-Grenadines.htmlView Afro-Vincentian in all countries.